Earth Day is Monday, April 22. Glass yogurt jar, and making my own yogurt. On this Earth Week, can you find ways to reduce your plastic footprint? I am happy with my recent efforts to reduce plastic: Plastic rapping on toilet paper is gone, milk for yogurt making comes from a reusable bottle, and I refill body lotion jars with scent-free lotion from my local food coop. Refilling bottles with body lotion reduces lots of plastic! Plastic is very harmful to our Earth, but it is also harmful to our health. Read about the seven types of plastic and which ones are the most harmful to our human health here. Also, a new study claims we are even inhaling microplastics. We need to become aware of the harm plastic is doing, and I hope you will start the effort to boycott plastic today. Bring your own reusable bags. Read about the ten companies that are flooding our planet with throw away plastic. They need to take responsibility for the harm they are doing! How are you reducing your plastic footprint? Plastic lasts more than a lifetime! Humans have created 9 billion tons of plastic since 1950 and most of this plastic still exists on earth. Only 9 percent has been recycled, and 11 percent incinerated. That leaves much of the plastic ever produced floating around in our waterways, poisoning fish, or releasing chemicals in landfills. As citizens of this planet we should be doing everything we can to reduce the amount of plastic we use. What is Overshoot Day? It is the day the people on earth start using more resources than the Earth can renew. In other words the last five months of the year we are living on borrowed time using more resources than the Earth can regenerate. Earth Overshoot Day marks the date when we (all of humanity) have used more from nature than our planet can renew in the entire year. To stay even we would need 1.7 earths to live on. All countries are not equal in the amount of the earth’s resources they use. The United States is not great, using the most resources. The USA would need 5 Earths to supply their needs, Australia would need 4 Earths to meet their needs, China would need 3 Earths, and India and many other countries helps balance it out and only would need 7/10th of an Earth to meet their resource needs. Read more here. We use the resources of 1.7 Earths. We use more resources and services than nature can regenerate. What about the future? I wish it were easier to solve this problem. We consume too much and waste even more. Everyday we need to think how important clean water and clean air are to our survival. Start by cutting food waste, use fewer chemicals, strive for zero waste and quality when we make purchases, and of course, drive less. If everyone does a small amount, it can add up to a lot! Cities: If we reduce driving by 50 percent around the world and replace one-third of car miles with public transportation and the rest by walking and biking, we can #MoveTheDate of Overshoot Day back 12 days. Energy: Reducing the carbon component of humanity’s Ecological Footprint by 50 percent would #MoveTheDate 93 days. Food: If everyone in the world cut food waste in half, reduced the Footprint intensity of their diets, and consumed world-average calories, we would #MoveTheDate 38 days. Population: If every other family in the world had one less child, we would move Overshoot Day 30 days by 2050. What are you doing to reduce your global footprint? Today as I was grocery shopping, refilling my containers, striving for zero waste, and being plastic-free. What good ideas do you have? The Minnesota Legislature is debating preemption laws to keep cities from banning plastic bags and Styrofoam containers. Other legislatures throughout the country are prohibiting cities from banning plastic. In the United States we can’t depend on lawmakers to do what is best for our earth, so we must responsibly choose to do the right thing ourselves. See poster below. I would add to this Bristle poster, Never purchase products in Styrofoam. Author health4earthPosted on April 26, 2018 April 26, 2018 Categories clean water, reduce. reuse. recycle, sustainableTags BBC, Earth Day, Great Britain, Minnesota, reduce, RefusePlastic, Reuse, single-use plastic, StyrofoamLeave a comment on Huge News on Plastic! My message for you on this Earth Day is, “Young people want a livable future!” All of us can make a difference for that future. Not just on Earth Day, but everyday! 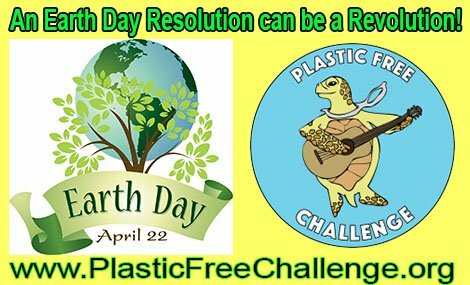 The theme for Earth Day 2018 is, “End Plastic Pollution” Here is an interview with the founder of the original Earth Day. If we continue the path we are on with plastic pollution, we will have more plastic in the ocean than fish by 2050. Business lobbyists are working hard to make sure we use plastic products. Laws are being passed to stop cities and counties from banning plastic bags and plastic/Styrofoam containers. We are in a sad place when the lobbyists have more power than the common good of everyone. These lobbyists make me more determined than ever to boycott their awful plastic products. What are some ideas to reduce your plastic use? Here is an excellent article from Minnesota Public Radio(MPR) on what you can do about plastic pollution. When a plastic product comes your way, ask yourself: Do I really need this, or can I use something else? Chances are you can say no, and yes. Each one of us can make a huge difference. On Earth Day 2018 set a simple goal for yourself, something that is easy to do. Maybe just keeping your reusable bags in the trunk of your car, or refilling olive oil and balsamic vinegar bottles at your local grocery. Maybe refusing to purchase anything in Styrofoam or never again using a plastic straw. You know your situation, what works for you? Make sure your environmental goal is easy to accomplish, and something you have a passion or interest to accomplish. Remember, our youth want a livable future. There are always new things you can purchase in bulk, instead of plastic. My newest way to avoid plastic using bulk hemp seeds to make hemp milk . Trying to reduce one plastic container at a time! Working together we can make a big difference! Everyday there is a new report about the world’s terrible problem with plastic pollution. How did we ever get to this point where plastic pollution is everywhere and so harmful? A world summit is needed to manage this problem. The plastic bottle manufacturers need to be held responsible, but all of us are to blame for the amount of plastic we purchase. Everyone uses plastic and we are all to blame! Plastic is used and thrown away by the wealthiest and poorest people on our planet. It is almost impossible to avoid. I have been working on reducing my plastic for years and become better every week at eliminating and evaluating what I purchase. Twice a week I take by reusable bottles to food coops and refill with bulk items. I reuse plastic produce bags over and over and think “zero waste” as I shop. Say “No” to plastic bags! The Great Pacific Garbage Patch (GPGP) floating off the coast of California now measures 1.6 million square kilometers (about 1 million square miles), according to a startling new study. It is 16 times larger than previously thought, and growing! To put that into perspective, the clump of trash is about the size of three Frances, or twice the size of Texas. What are you doing to reduce your plastic pollution? ?